So you are struggling to lose weight because you know once you achieve your goal you will be happy right? Well, let me be the bearer of bad news; that’s not going to happen! Happiness is not determined by a measuring tape or a weight scale. You see happiness is “a mental or emotional state of well-being characterized by positive or pleasant emotions…………….” (- Wiki) and positive emotions are created by you on a daily basis. It is sad to see that people today think that a human-being is body first and that the soul, mind, or conscious is secondary when it’s actually the other way around. Let’s face it, it does not matter how skinny you are, if you are a negative person or someone who worries about each and every thing, you will be miserable despite all the blessings that are around you. Of course you should work out and work out hard in order to get fit and get to your ideal weight; which brings me to my next point. Stop looking at those crazy before and after pictures on the internet. 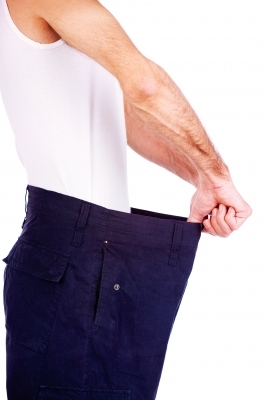 You need to find out what your ideal weight is and not go overboard by losing too much weight. That will do you more harm than good. Be happy that you are leading a healthy life and consider the weight you lose a reward and not just a target. Be realistic in setting your goals but be happy today and don’t wait till you lose 100 lbs. Life is what is happening to you now so be happy now. Andrew Dixon of Huffpost Healthy Living wrote an interesting article on this subject called “Seduced by the Illusion: The Truth About Transformation Photos”. What you see is not always what you get when it comes to transformation photos. The “transformation” didn’t end there. This does not mean that all transformation photos are fake. There are a lot of people out there putting in some hard work and getting some great results, but the point is you should not feel frustrated when your transformation photos don’t look as amazing as theirs. Most importantly, remember to be happy today and don’t wait to look like a fitness model to start being happy. Weight Loss, Health and Happiness? Excellent! I remember the happiest I was, the freest I was. I weighed 114 lbs and I loved running! I completely agree with you here! I spent most of my life thinking ‘if only I was skinny, I’d be happy’. Although loosing weight does not guarantee instant happiness, it did change my life for the better in terms of confidence and better mental health!! Thanks so much for writing this! It’s sometimes hard to articulate why losing weight doesn’t always equal happiness. Of course there are many reasons to lose weight besides trying to get more happy which should be read about https://loseweightnowprograms.wordpress.com/2018/06/20/16-reasons-why-you-should-lose-weight-now/, but this is a great article about this topic. Thanks again! Hi there I have a blog here in New Zealand. I am a personal trainer. Would you allow me to share this to my blog? Or perhaps would you be willing to do a guest post? You are so right! Happiness can never be based solely on appearance. You have to learn to love yourself at any size and if and when you lose weight you gain more happiness, not because of the way you look but because you set a goal and reached it. I truly feel that happiness is more easily achieved when you pay attention to spiritual things. Matthew 5:3 says, “happy are those conscious of their spiritual need.” Thank you again for this wonderful post! In short, physical changes never bring a person’s happiness. Very interesting…Do you think this might help make a person feel better about themselves after weight loss? BJ, author of Near a River, http://www.nearariver.com. Very interesting…I do think that there is something to be said though of loving yourself enough to treat yourself to a healthy lifestyle and putting yourself first to achieve those goals. Skinny bodies never satisfy for long. It’s the satisfaction of the journey that can bring the happiness in my experience. Thank you Rose well said. Its very interesting to read.Loosing weight brings well being but certainly not happiness. Great post! It was good to touch on the reality behind before & after photos. What we see on social media is usually not the whole story! Thank you so much. You also write quite well. Yes, anything that has the word ‘ media’ on it should be taken with a pinch of salt. Very true! And well said. Too many people are controlled by “weight” rather than their feelings. I always tell my personal training clients to feel their health, fitness and weight loss rather than measuring them constantly. I also tell them to ignore “transformation” photos – there are so many bogus shots! Interesting post. In trying to quote you said, “You need to find out what your ideal weight is and not go overboard by losing too much weight.” This is the main point that all of us must get. You nailed it. There’s a classic saying among photographers that goes “if you mess up a portrait you will need to apologize, if you damage a wedding you must leave town”. will be taken the day of the wedding and just how many prints delivered. Photoshop can make a pig look hotter than Beyonce. – quote of the year! True, very true. Thanks for taking the time to comment. This is kind of a balm to the soul. I’ve been hearing folks tell me I would be happy if I dropped 50 pounds for a long time now. I love myself now. I don’t need to loose weight to say that. If I loose it, I’ll still love myself. Congratulations; that in itself is a great achievement. Enjoy your life to the fullest.This blog is about impacting people to make the right choices so your comment just made my day. Thanks! I am glad I could be of help. Hey All, welcome to another week of health, fitness, and opportunity! Below is a re-Blogged Post from https://the-zeit.com/, and its a beauty! If you think just losing weight or getting more muscle will make you happy, think again. It’s the holistic, 100%, inside-out approach that will make the difference! Visit https://the-zeit.com/ for more great Posts! In the meantime, we hope you enjoy this! Hey Mate, great Post, and so important for people who are trying to transform themselves physically realizing that it only happens if the mental and emotional transformation is there too! Are you cool for me to re-Blog this? Thanks Rich! Great to see you and others reacting positively to this post. I would absolutely love it if you re-blogged it, so please go ahead. Perhaps one of your readers will get inspired and they will pass on the message too. That’s what we are here for. Thank you for dropping by and enjoy the weekend! What an amazing message. Definitely food for thought! Thank you Amber, I hope this message get’s to all those who are struggling to be happy in life. If they’re struggling – they’re looking for a message like this. Hope it resonates with them like it did me. very true words. Happiness cannot be achieved by changing the physical, must truly love yourself first. Also I’ve noticed the Instagram transformation Tuesday photos. Seems like everyone’s a trainer now. Well said, it is quite a challenge though for people in the developed world because many of us here have our happiness determined by what people think of us. So imagine if people compare us to what they see on television how difficult it becomes to be happy. Welcome from Bulgaria! I am having enjoyment of your blog site. I find this a valuable tip. In weightlifting there are classifications of weight which one must maintain in order to compete. However many women do not compete and so must be weighed by their husbands or they will try to pull tricks as this trainer did with photoshop filters and hair extension, but meanwhile bather bottom is getting much bigger! This was a great read! For more help in this are please like my site! Topics include cyber bullying and how to stop it and having self respect. Thanks for taking the time Dave, glad you enjoyed it. Thank you Ray, I appreciate it. Just trying to help my dear readers the best way I can.